Versatility. It’s a good thing. Nobody likes a one-trick pony. I feel that way about food sometimes too. Yes, there are dishes that require exacting precision, where there can be no deviation from the ingredients or their amounts. 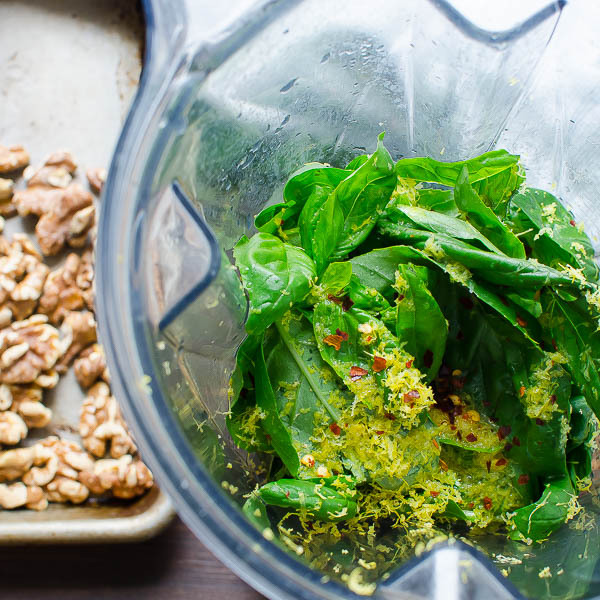 This Basil Walnut Pesto isn’t one of them. I’m talking about pesto. To me, it is truly a multi-faceted condiment. I decided to make a batch after a trip to the farmer’s market recently where I bought some beautiful, fragrant, fresh basil. At the market, they sell the whole plant — roots and all. It isn’t an exaggeration to say that these plants are at least 24 inches long and take up a standard size grocery bag on their own. So, of course, I had to make a pesto. Why not? It comes together in minutes and can be used to enhance and dress so many savory dishes. Do you doubt me? Let me explain… of course, you can simply toss pesto into pasta and have a delicious meal. But have you ever used it as a spread on an italian panini sandwich? Or as a topping for grilled fish or chicken? Thinned it out a little with additional olive oil and lemon juice and then swirled into a steaming bowl of minestrone? 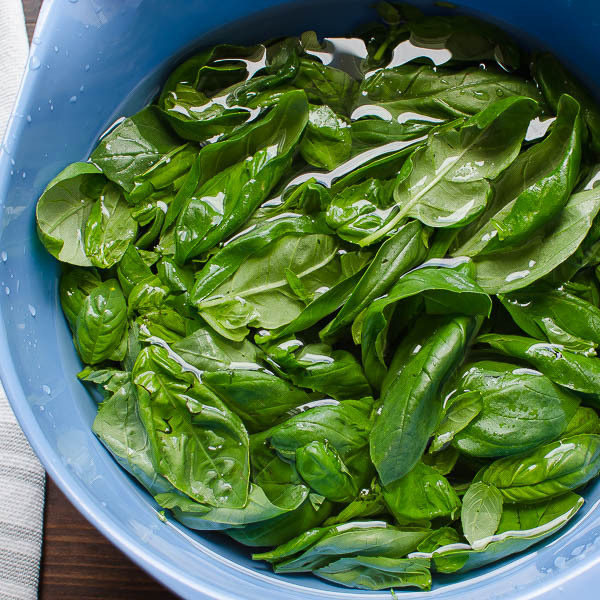 Try pesto it instead of tomato sauce on a white pizza, or add a tablespoon to your next vinaigrette to add another layer of flavor. Pesto tossed with green beans is an easy, flavorful side dish. I’m telling you pesto sauce is like that scene in Forrest Gump where Bubba is talking about all the ways to cook shrimp. By the way, pesto goes great with shellfish, too! Whatever you intend to do with your pesto, I think this version is a good starting point. 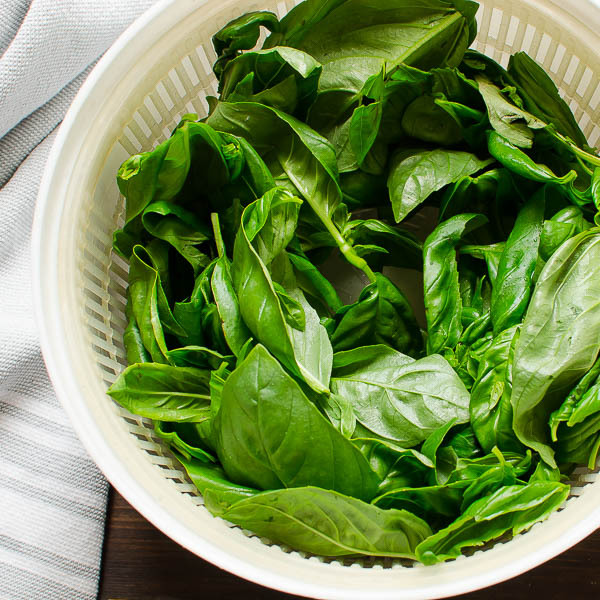 Of course, if you want to get crazy, you could substitute arugula or spinach for the basil, you could use traditional pine nuts or other nuts like pecans or cashews. 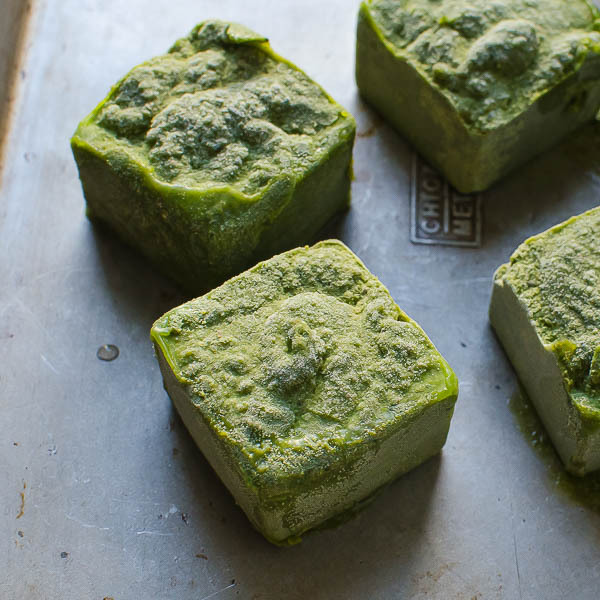 And here’s a fun tip: When you have copious amounts of basil, go ahead and make copious amounts of pesto — then freeze it in silicone ice cube trays. When the pesto is frozen, pop them out and transfer to a freezer-safe storage container for use whenever you need it. That way you’re never caught empty handed. 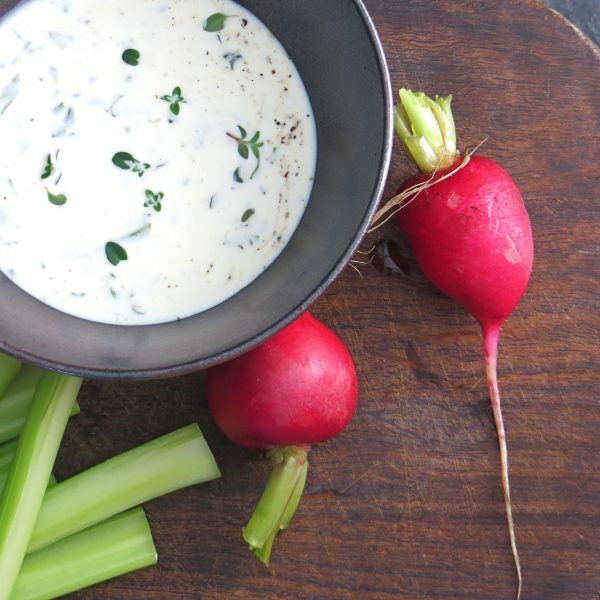 The finished product is silky and flavorful with the vibrant basil and hint of lemon. 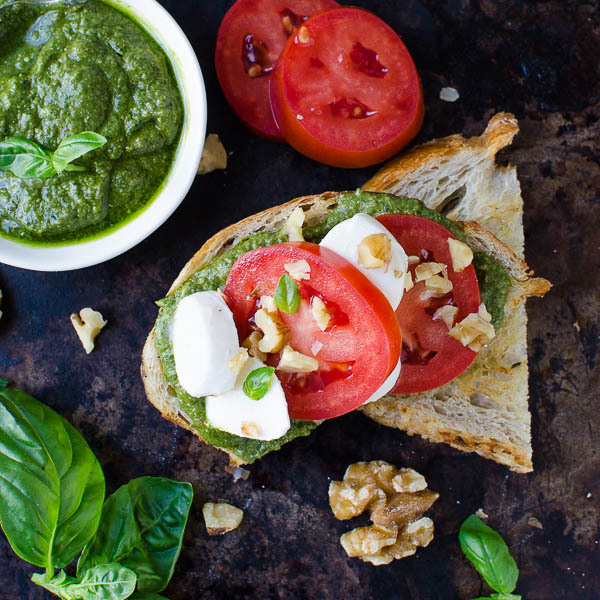 Here’s yet another example of how to use your pesto – slathered on grilled bread and topped with ripe tomatoes, mozzarella and a sprinkle of chopped walnuts. Pour a glass of wine and meet me on the patio! Nope, it’s definitely not a one-trick pony! A simple pesto with a kick of red pepper! 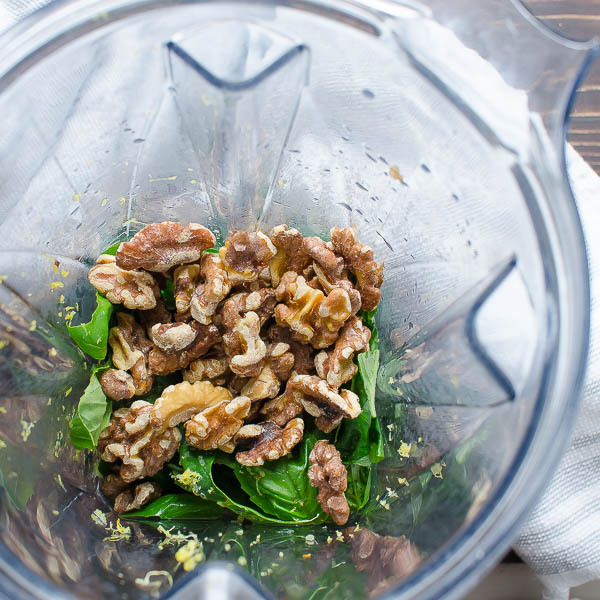 To the bowl of a food processor or Vitamix blender add basil, garlic, walnuts, parmesan, lemon zest, juice, and red pepper flakes. Pulse a few times to break down the basil. In a steady stream add olive oil, pulsing until olive oil is blended into other ingredients and mixture forms a loose paste. If your pesto is too thick, add additional olive oil one tablespoon at a time until you reach the desired consistency. Your recipe sounds great! How long does this pesto last in the regular fridge? You can keep it for 5-7 days, but I would put a thin layer of oil over the top of the pesto to keep it fresh and bright. The oil will protect it from oxidizing. 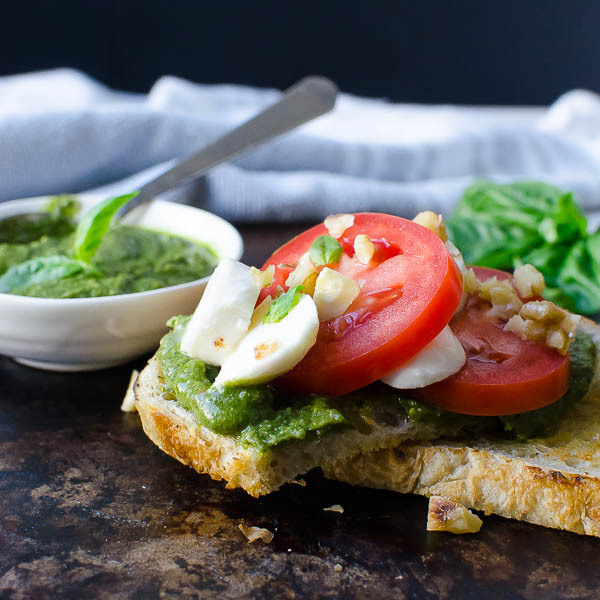 Amazing, nutty, layered and bright pesto! What a lovely variation on a pine nut pesto. This is much better and healthier for you! Perfection! 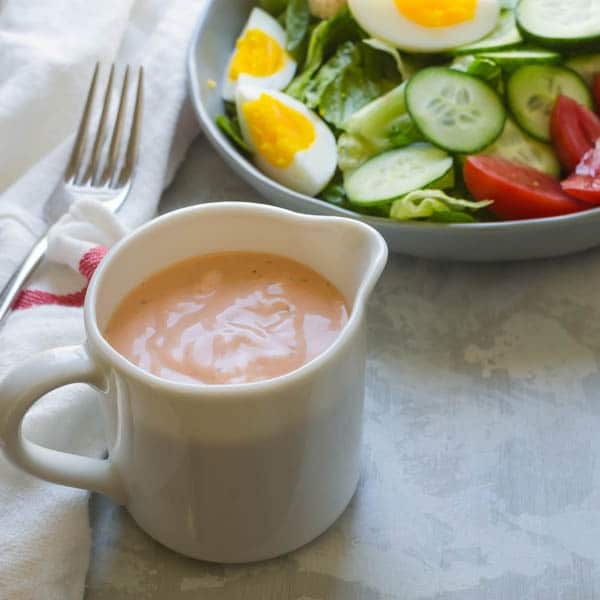 (I left out the red pepper flakes for my kids and this recipe was still amazing!) Thank you! is a serving 2 tablespoons? Actually, I believe it’s more like 3 tablespoons — just shy of a quarter cup. I followed this recipe to a T and found it overpoweringly lemony despite loving lemon. I would significantly reduce the lemon. Lucky you! Macadamia nuts would be so buttery and amazing! 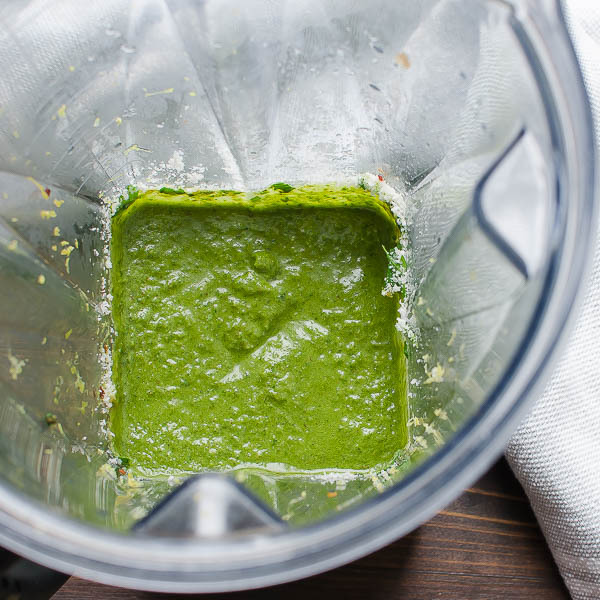 You can also freeze pesto in an 8 oz. 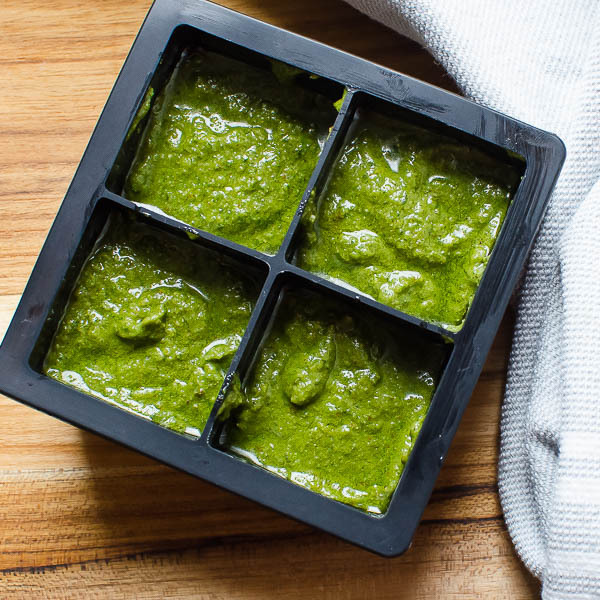 Ball Canning jar by filling the pesto to not more than 1″ from the top and then topping with a thin layer of olive oil to protect the fresh pesto, seal and freeze. One 8 oz jar of Pesto is enough for a pasta dinner for 4-5 people. Love Pesto of all kinds, thank you for the recipe. What a great idea, Trudy! I love your thought to add an extra layer of olive oil to protect it. Genius! 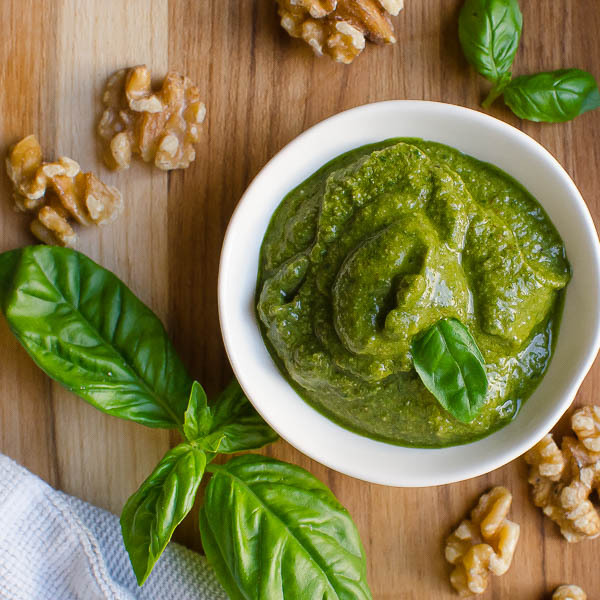 Is there anything better than fresh, homemade pesto?! 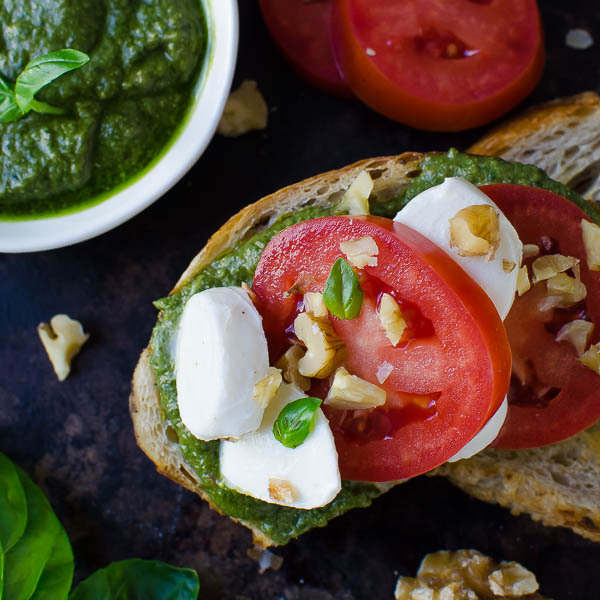 I really love the flavors in simple soups and that caprese toast has me hungry again! Food on toast is always the best — these were actually grilled sourdough toasts — and they’re super yummy! 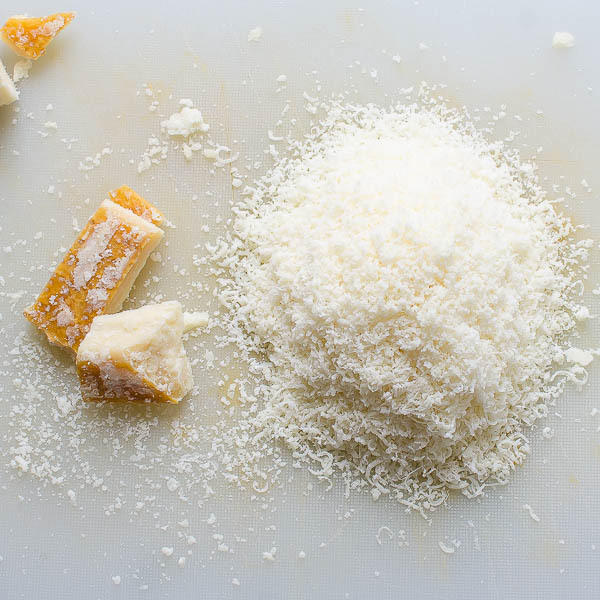 Love all of that beautiful basil and parmigiano-reggiano! 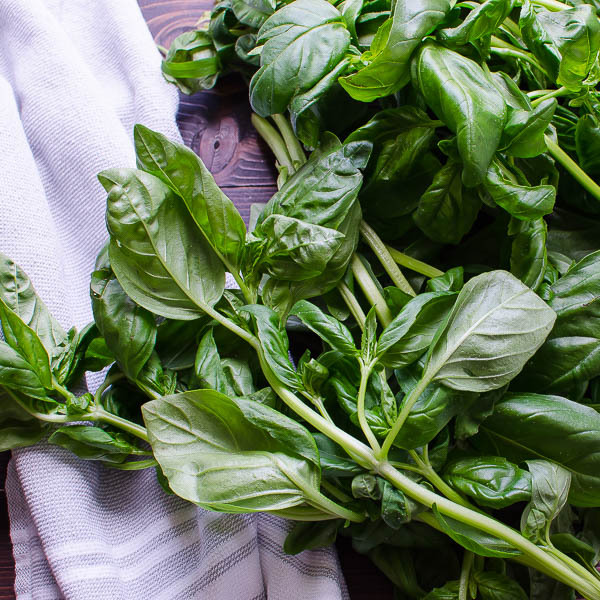 I LOVE pesto, it’s one of my favorites and we tend to make a lot of it when basil is in season. I love that you freeze the pesto, that’s such a great idea. Freezing is the best for me, because I have a VitaMix blender and I need at least a cup of something to make it “blend”. But 1-2 cups of pesto is just too much for one recipe, therefore, I freeze. Definitely use silicone ice cube trays though — it’s virtually impossible to get out of regular trays unless you defrost it — and then — what’s the point? Oh my gosh, what gorgeous basil you found! Your pesto sounds wonderful, and I love all of your suggestions for using it in various dishes. Beautiful photos too! 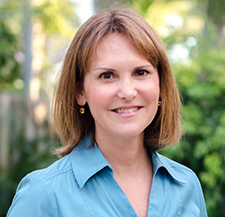 Thanks, Andrea! 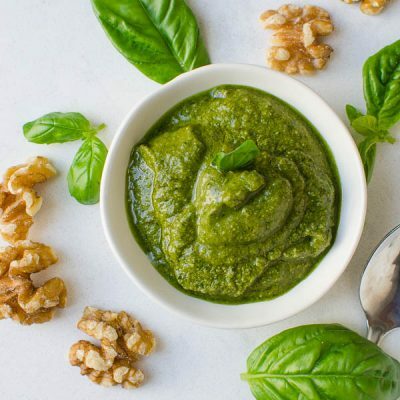 Pesto is an absolute must for spring and summer! I just bought a basil plant and have great plans for it. Do you propagate your buds? I do through out the growing season and end up with a ton! Your pest is on the “to do” list. Freezing is an excellent idea, too. Propagate what? Who? I’m gonna need a step-by-step on that — you are talking to a BLACK THUMB! So gorgeous and fresh. I cannot wait to start growing basil in my garden. Love that tip to freeze it – what a great idea! This looks like an absolutely delicious pesto! Pesto is so versatile isn’t it? I love it how it can compliment so many dishes! I feel the same way about it, Hope! I love your tips! And this recipe looks delish! Our market sells it in a large bunch also, what a great idea to make it into pesto. The freezer tip is a great idea too!! When you’ve got that much basil, pesto is a must! This recipe looks so delicious and refreshing. I agree that sometimes you don’t want a recipe that is set in stone. Pesto is so amazing, I love how you’ve used it. Thank you, Angela! I’ve got a bunch more pesto ideas coming soon!